All fiberglass isn't made equal. 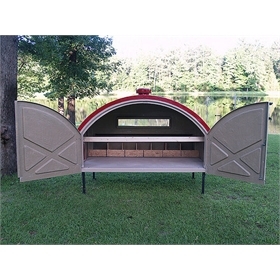 This quality, American-made fiberglass chicken coop will never need painting, never rot, never rust, never corrode and never break down in extreme temps. This model comes fully assembled and has some pretty great customization options. See below for full coop details. Fiberglass is an incredibly durable building material: pound for pound, it’s stronger than concrete, steel and aluminum. 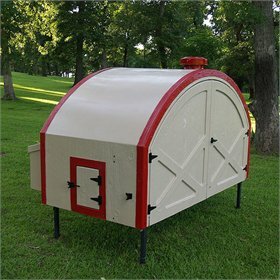 This chicken coop was created by an American company that has been in business, perfecting the art of fiberglass, for over 50 years. Their fiberglass will never rust, rot, corrode or need painting. It is made of the most durable, high quality, long lasting fiberglass materials available, spray coated with a tinted marine-grade gel that chemically bonds with the fiberglass laminate. See color chart photo above for available color choices. 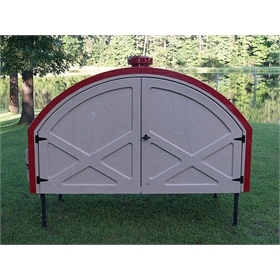 Though lightweight compared to wood, if you’d like to make your coop into a tractor, you’ll want wheels! There are two optional wheel kits in the pull-down menu above. Both include a tow bar, two front caster wheels, two rear fixed wheels, and a handle for easy moving. The standard pneumatic wheel kit has tires filled with air, whereas the solid wheel kit has “no flat” tires. You pick your own lock for this coop. There are latches for each door, and you can decide how you want to secure them: padlock, hitch lock, spring-loaded clip--whatever works for you. Just make sure it’s too difficult for raccoons to figure out! Just lift the nest box lid and reach inside to fill up your egg basket. 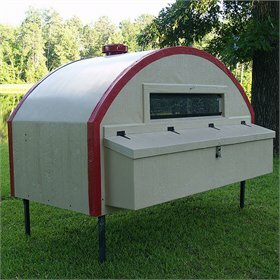 The lid is lockable to prevent access by critters who would feast on your eggs (and chickens)! 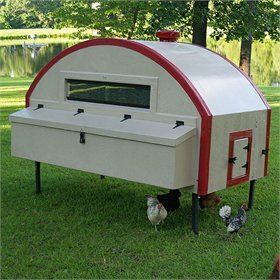 When you purchase this coop, you’ll be asked to choose whether you want the small “chicken door” on the left side of the coop or the right. (Consider the nest box side of the coop the “front”, and choose left vs. right based on that.) This might matter to you, depending on how plan to connect your coop to the run. 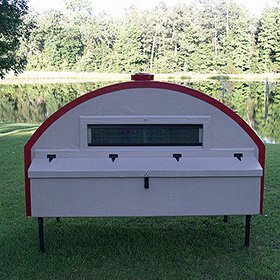 This coop has two sliding windows on the front, with galvanized hardware cloth screens that keep predators out, plus an 8” round vent on top that comes standard, and will match the trim color you’ve chosen. 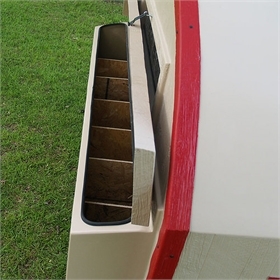 This top vent can even be purchased with a solar-powered fan for added effectiveness! The color chart photo above shows your six color choices for the body and trim. Mix and match as you see fit! As you can see in the pictures above, there are many options for making your coop look unique! Keep in mind that this coop, like every coop we sell at My Pet Chicken, is NOT intended for full-time confinement. 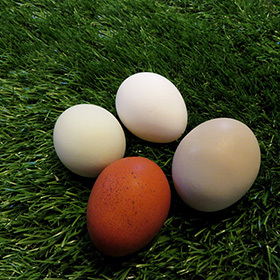 You will need to provide an outdoor run area in which your hens can spend most of their time--or allow them to free range. Quonset Hut coops ship fully assembled. Just insert the 18” metal legs into the steel support base, and place your coop where you want it! Please allow 3-4 weeks for your coop to arrive. This coop will arrive in one crate that weighs235 lbs. and measures 99”x63”x68”.There will be a lift gate for easy unloading. Once your coop arrives, please carefully inspect it prior to signing for it. The manufacturer insures each Coop for the full purchase price, but they can't replace any missing or damaged pieces "free of charge" unless its noted on the Bill of Lading that there is an indication of damage. Even if all you notice is that the wrapping on the pallet is not neat or is frayed, please do make a note of it before signing for the coop, and notify My Pet Chicken right away. Please note: we do not have a storefront and orders cannot be picked up at our location. We can only ship within the United States. 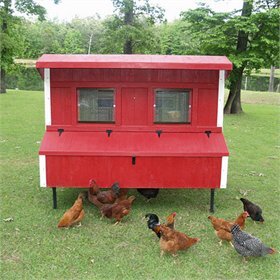 Shipment of chicken coops is limited to the 48 contiguous states and not Alaska, Hawaii, Puerto Rico and the other U.S. territories.